AudioGo have announced the third series of audio adventures starring Tom Baker as the Fourth Doctor and written by Paul Magrs; Tsar Wars kicks off the Serpent Crest series, with the Doctor accompanied by Susan Jameson as Mrs Wibbsey. The Doctor and Mrs Wibbsey are catapulted from present day Earth to a futuristic civilisation in a distant galaxy. At the Robotov Palace they find the Tsar and Tsarina ruling over their empire whilst human workers toil on satellite moons. The Doctor is mistaken for an old ally of the Tsarina's, but then suspected of treason when the Palace comes under attack. Dark secrets are lurking in the shadows, and the mysterious Father Gregory will set off a chain of events which have long-lasting consequences for the Doctor and Mrs Wibbsey. 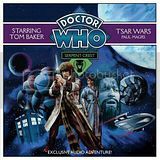 Featuring a dual role for Tom Baker, Tsar Wars features a superb line-up of guest actors including Michael Jayston, Simon Shepherd, Suzy Aitchison, Paul Chequer, Gabriel Vick, Grant Gillespie and Sam Hoare. Future installments of Serpent Crest will see the return of the Doctor's previous companion in these series, Mike Yates as played by Richard Franklin, and will also include Terrence Hardiman, Joanna David, Geoff Leesley, Su Douglas and Andrew Sachs.